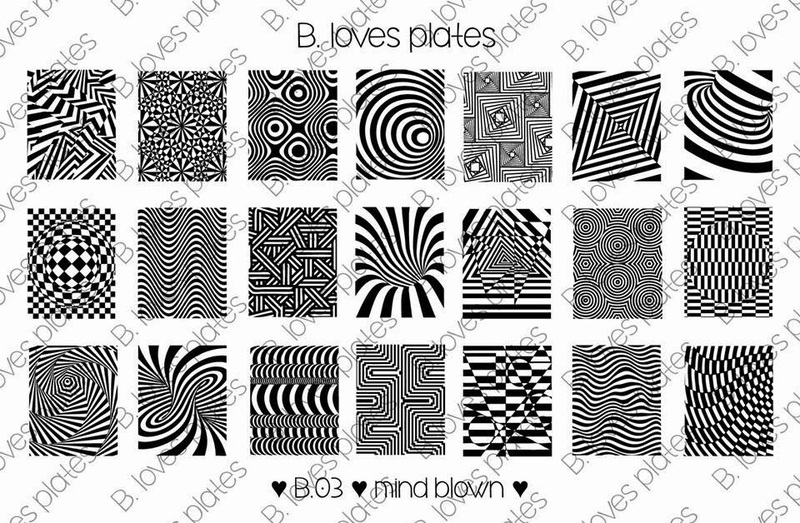 Lacquer Lockdown: Hot Off The Stamping Press: B.Loves Plates Nail Art Stamping Plates! 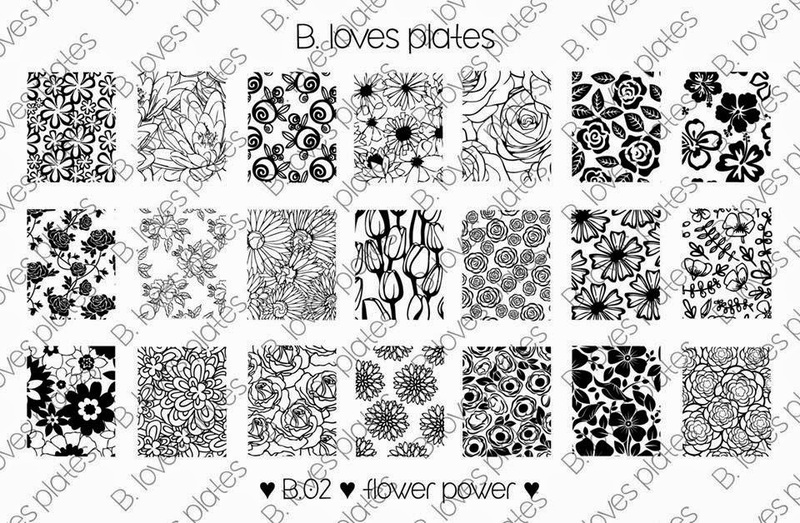 Hot Off The Stamping Press: B.Loves Plates Nail Art Stamping Plates! Twenty one serious images of the geometric variety from simple to very vey intricate. This is a solid plate to add to any collection. A plate that by the very nature of its design lends itself to leadlighting technique! This is my favorite of the 3 and an instant no brainer to love. Mind blown is a Magic Eye and most of them are new to me images! Cool right? I can see a whole fun series using just this plate. So what do you think? Welcome to the family BLovesPlates! So guess what? Right now this brand is running a fun little competition on Facebook. You can purchase these plates here on Etsy. They retail for $15USD + shipping. Right now I only see one plate, the Geometry plate listed so it may be worth waiting. 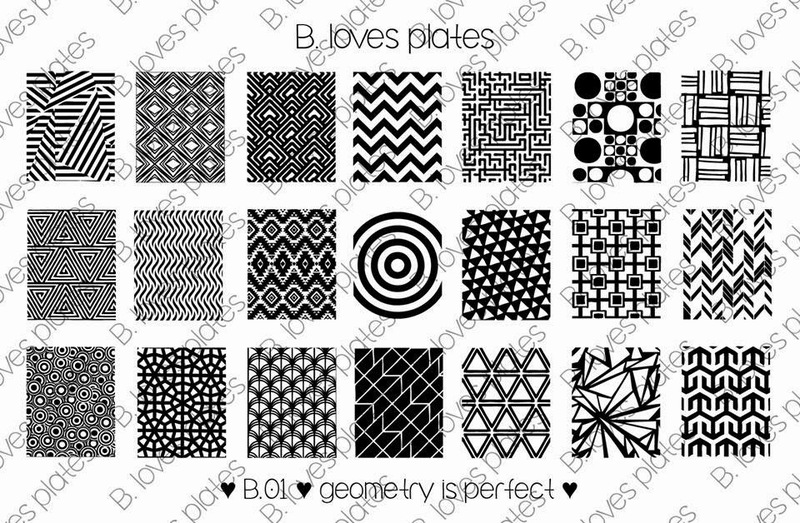 I adore geometric designs so the first and last plates are amazing to me. Do you know yet how large the images are? Sorry dear. When i have it I always put all the pertinent info up on a post. When I do know I will update it usually though it's because I purchased the plate and reviewed it.